Several shawls all finished in the span of a few weeks! I am amazed, I didn't think I could ever finish these shawls, but apparently I've finally had a shawl spree instead of an amigurumi one, so I finished 3 of them! The pink one I started over a year ago. Verrry thin cotton yarn, large hook. It has 18 shells on each side. 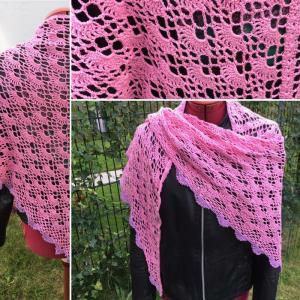 This is the Fantasm shawl. The blue one I finished after that, but I made that one in 3 weeks. Very fast. Looooove that yarn, it was Drops Cotton Merino. So soft! The pattern is the Arvai shawl. I started the knit shawl in may, and just finished it today. Love it! So proud of it! Used exactly one skein of Katia Riff Socks, which was my souvenir from Spain. The thingies on the end were an idea of someone on a facebook group, and suits it so well! This is the Linus shawl. Very easy! All three are lovely! Your work is really nice and I love the yarn and colors you've chosen. All three are beautiful! Beautiful colors and beautiful work! They are lovely!! What do you do with your shawls? I teach a crochet class, and we've been making prayer shawls for our local Hospice for about 4 years. It's such a blessing to be able to ease sore hearts with them! Thankmyou! Actually, I just keep them for myself. I love wearing them, and this is the first time I've gone so fast with them, as usually I mostly make amigurumi. The blue one is going to my husbands grandmother, though, as she requested me to make one for her. I definitely want to make another one of those for myself, I absolutely love it! Thank you for using your skills for good! Those are all very pretty. Wow! These are all gorgeous!! Your shawls are beautiful! I'll bet your husband's grandmother will be stunned when you give her the blue one! 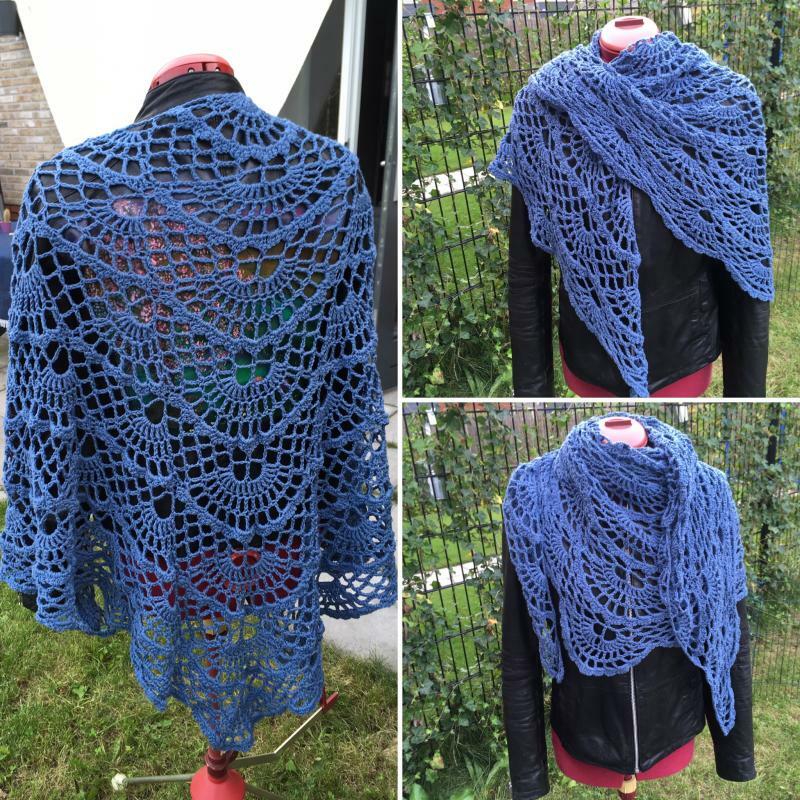 Somehow I missed this post back in September, so, I will say now that all 3 shawls are beautiful. The tassels on the knit shawl are a perfect touch to it. Your grandmother must have been delighted with her gift. Grandmother's are the best! Wow you have been busy. 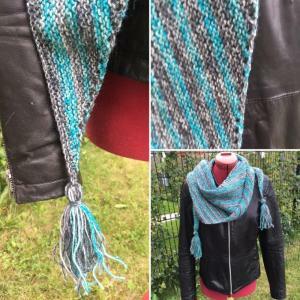 Your shawls are really beautiful and I love the tassels on the knitted one. Those are some BEAUTIFUL shawls there. How long did it take you to make one? Thank you all for your lovely comments! I appreciate it I have actually spent over a year on the pink one, several months on the knit one and a few weeks on the blue Arvai one. It's a big difference whether the yarn is thick, or the hook you use, and the pattern. They're all gorgeous but that grey and blue one is stunning and my favorite!!! Just beautiful. I am partial to the blue one.